Lyon Opera Ballet in Sarabande. Photo by Michel Cavalca. BOTTOM LINE: William Forsthye's Steptext and Lyon Opera Ballet's dancers are equal forces of excellence that have met their match. Sarabande by Benjamin Millepied was choreographed in 2009 and is inspired by a Jerome Robbins' solo A Suite of Dances for Mikhail Barshinikov, which he also danced. The performance starts off with a flautist playing and a solo by the virtuosic Tadoshi Kokeguchi whose beautifully daring dancing stood out in the entirety of the program. 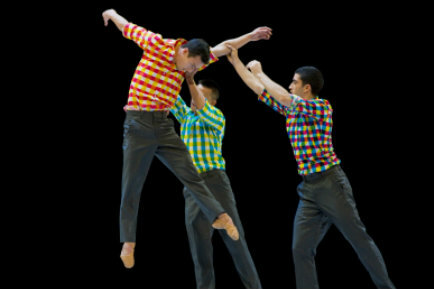 Dressed as if popping out of a fashion forward J.Crew catalogue in khaki pants and bright plaid dress shirts, these ravishing men masterfully execute high leaps, tricky turns and transitions. They all walk in the same predictable way and stroll center stage to begin their dancing. Of visual interest was the solo that was performed once, then another man was added in, keeping the first man's solo the same as it became a quartet that had a group's context. There is nothing groundbreaking about the contemporary ballet steps or choreography in Sarabande, but the virulent dancing recalls boyhood and it was well danced. In Sunshine by Emanuel Gat, as the curtain lifts up, the nine dancer ensemble starts in a tight circle and it feels as if you are watching people standing around a crime scene. The sound is the conductor giving notes to the orchestra as they rehearse Handel’s "Water Music, Suite 2" and the dancers complete physical tasks. As the dancers pull away from each other and rebound in, it feels like you are watching a pinball machine in slow motion. This process is much more collaborative and it shows as there are so many ideas and phrases, the only constant is its busyness. When there is a solo or duet happening, the dancers often frame by standing around the action. At some points, the dancers hang off the stage in contorted positions. The field of depth in this piece is well used as it really does feel like a cosmopolitan dissection. William Forsthye's Steptext begins again with a man dressed in all black in an almost pitch black stage with grey socks. His arms are striking and the solos in themselves are crafted with stunning precision. The first one goes by in silence and part of the music starts. It starts and stops throughout the whole performance. A woman in a bright red unitard enters stage right doing strong gestures of the arms with the hands locked in fists. This develops into a quartet of three men and the almost aggressive woman who ends up partnering with each of the men. The gumby-like Kristin Bentz is partnered in and out of the splits, but this is not her only feat as she takes this abstract piece and throws herself into it, and you can feel her sassiness oozing out. All throughout the piece, the music stops and starts, and the lights go in and out to remind us that this is a performance, and that we have created an environment for this to exist and it wouldn’t without it. This dance is still current, though it was choreographed in 1986. It challenges the audience and brings to light the reality of the concert dance setting. Lyon Opera Ballet has a wonderful group of commissions for the company and this program was varied and focused on the versatility and breadth of their dancers.